Philip Payton’s history of the great county of Sussex is research with a genuine talent for writing, this superb new book tells the story of Sussex from ancient times to the present day, exploring some very interesting themes along the way. This really is a great book. It is brilliantly readable, beautifully illustrated and comprehensive, and will be a must for anyone interested in the history of the county, or indeed Great Britain. This will definitely become a classic, look out for excellent reviews! The author is a British historian and Emeritus Professor with a talent for bringing history to life. Orders placed on the website prior to the publication date: Books will not be available until 25 September but your card will be charged. Sussex is that most quintessentially English of counties, with its rich range of pastoral and maritime associations, its cultural and social connections. Easy perhaps, given this benign image, to overlook its somewhat turbulent past, in which it has endured – and survived – much conflict and invasion from a variety of sources. Philip Payton, in his ambitious yet highly accessible text, has succeeded in embracing the essence of this complex, captivating place via its eclectic past, right up to the present day. His story begins with ancient peoples and landscapes, the opening chapter citing the famous Long Man of Wilmington, a legendary landmark high on the Sussex Downs of uncertain lineage: possibly Iron Age or even earlier. Next, the Romans and Saxons, with a brief mention of King Cnut, whose abortive attempt to coax back the waves was said by some to have taken place at Bosham. No history of Sussex would be complete without focusing on 1066 and the Battle of Hastings, leading to the Norman Conquest with its resulting political, economic and ecclesiastical upheavals. 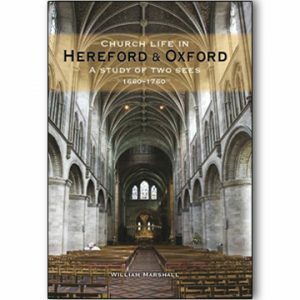 A defining event in English history, it is vividly described by the author, who includes a reference to the founding of Battle Abbey. Then on to the Peasants’ Revolt, the Black Death, the Tudors and Stuarts… and the Victorians. Payton’s account of Sussex in the Railway Age makes compelling reading. He charts transport links from the early 19th century’s horse-drawn stagecoach routes to the coming of the London to Brighton railway line – the latter following heated public debate over its possible environmental effects. The railway was, however, widely welcomed as a valuable adjunct to Brighton life with its growing popularity as both a desirable tourist and commuter destination. Back in 1881, a weekday Pullman train completed the London-Brighton run in “an unheard-of one-and-a-quarter hours” – a sobering thought in these 21st century times of inordinate delays and unpredictable timetables. A forerunner of the Brighton Belle, its Pullman carriages became “a byword for unparalleled luxury”, frequented in the 1950s and 1960s by the likes of Brighton-based actors such as Laurence Olivier, with his penchant for grilled kippers for breakfast. Sussex has had its share of literary luminaries who, as Payton acknowledges, drew inspiration from their surroundings: Charles Dickens (who stayed at Brighton’s Old Ship Inn among other addresses); Hilaire Belloc (Slindon, then Shipley); Rudyard Kipling (Rottingdean, then Bateman’s at Burwash); Henry James (Rye) and AA Milne (Hartfield). And we mustn’t forget that doyenne of the Bloomsbury set: Virginia Woolf (Monk’s House, Rodmell). There is comprehensive coverage of the war – and inter-war – years, with William Ward-Higgs’ famous song Sussex by the Sea (1907) adopted as the county’s unofficial anthem. Sumptuously illustrated throughout, this is a thought-provoking and rewarding read. It is obvious from the briefest glance at a map of Britain that Sussex, located at its southern fringes, must always have borne the brunt of attack and invasion from without. For Professor Philip Payton, the author of a brand new book, A History of Sussex, this accident of geography has been one of the key factors in shaping the county’s history, although by no means the only one. Armies, smugglers, traders, migrants and settlers; all have landed on Sussex shores. Some of these ‘invasions’ have been benign, adding to the life and culture of the county, while others have been violent and devastating. And yet it has always been, and still is today, a terribly English place: pastoral and in many ways genteel; rich in history, with much of it still evident today; quintessentially the England that draws so many to these isles from overseas. And this despite its sometimes turbulent past – or perhaps it is because of it. Maybe threats to a population’s territory, way of life and culture make it more aware of its identity, and thus more determined to retain it. 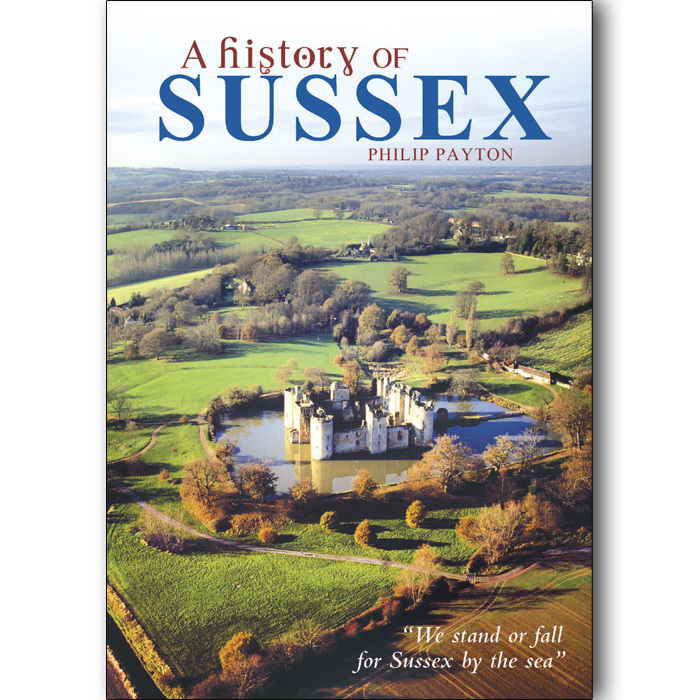 Whatever the truth, the history of Sussex is long, varied and fascinating, and Philip Payton has captured it in one comprehensive, highly entertaining, excellently researched and beautifully produced volume. The story starts with ancient peoples, moving on to the Romans and Saxons and 1066, and on to the Peasants’ Revolt, the Tudors and Stuarts, and the Victorians. Looking at wars, literature, industry and tourism, Philip brings the reader to the present, and reflects on what the county is today. This history of the great county of Sussex is a masterly piece of work. 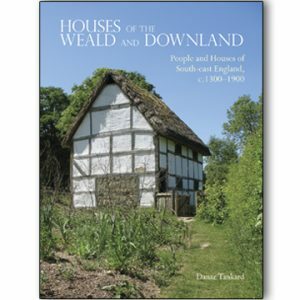 Combining sound academic research with a genuine talent for writing, Professor Payton in this superbly produced volume tells the story of Sussex from ancient times to the present day, exploring many fascinating themes. Above all, Sussex, with its rich history, pastoral and coastal beauty, and iconic towns and villages, is quintessentially and uncompromisingly English; the ‘real England’ of popular imagination, and the enduring ‘land of the South Saxons’. 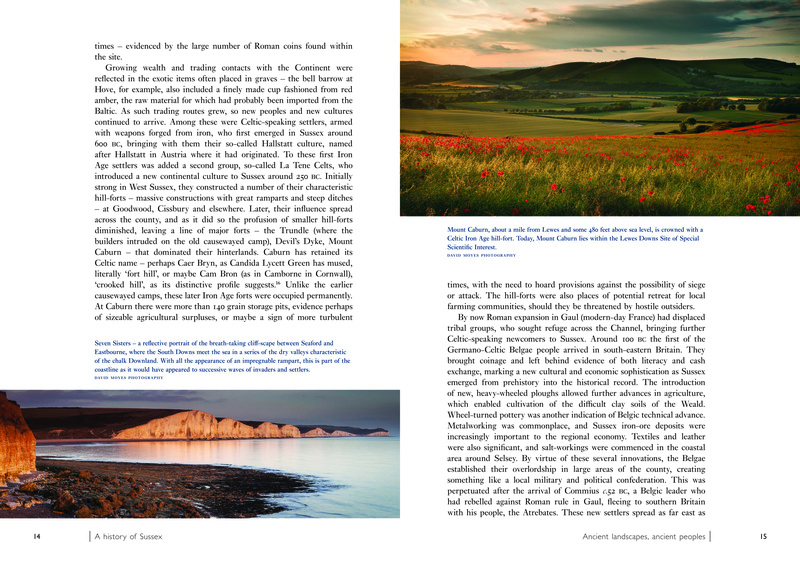 A History of Sussex is brilliantly readable, beautifully illustrated and comprehensive, and will be a must for anyone interested in the history of Sussex, or indeed Great Britain. Destined to become a classic. 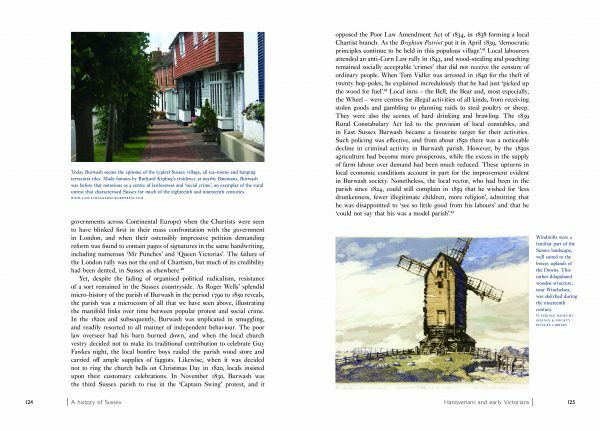 A History of Sussex is 320 pages, lavishly illustrated in full colour throughout, and has been produced in paperback to make it widely affordable. In 1912 an amateur archaeologist named Charles Dawson astounded the scientific world when he discovered the earliest human remains ever found in a gravel pit near the Sussex village of Piltdown, north of Lewes. Dawson built a worldwide reputation for his discovery, but that reputation was left in tatters when it emerged some 4 decades later that the skeletal remains were part of an elaborate hoax, with the skull constructed from a mix of human and ape bones carefully painted to give them an appearance of great age. The story of Piltdown Man is one of the opening salvos of a fascinating new book by Philip Payton entitled ‘A History of Sussex’, from Carnegie Publishing. 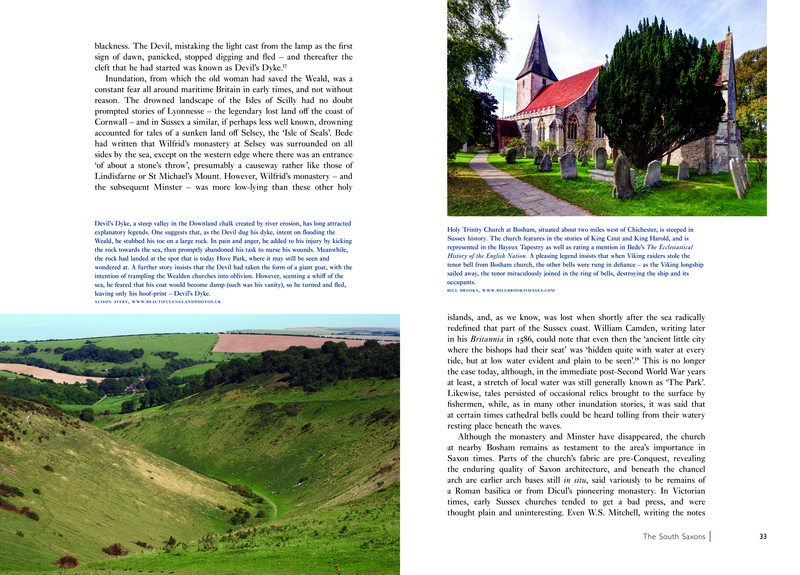 Payton has done a magnificent job of covering the broad sweep of Sussex history, from the first dinosaurs to the Roman invasion, from the Roman Saxon Shore forts to the devastation of the Black Death, and Sussex in the Railway Age to how people lived through the dark days of the Battle of Britain. The sheer scope of the book is impressive, and the amount of research that must have gone into drawing together so many sources of information is staggering. Payton has a gift for storytelling, and for making the dry events of history come alive through the words and deeds of the people who lived it. That is perhaps the most compelling feature of this wonderful book; the author makes the history of Sussex come alive, and brings characters and events to life in an exceptionally readable way. If you were subject to dull, drab history textbooks at school like I was, you may have been turned off history, hoping you’d never have to be subject to such tedium again. A History of Sussex is not that sort of book at all; this is a book to savour and enjoy, to open almost at random and dive into, only to emerge hours later wondering where the time has gone. Since its a history book, it naturally enough is arranged as a timeline, beginning with prehistory, and moving quite quickly from the earliest settlers in Sussex to the coming of the Romans. The Saxon age gets its own section, followed by the Normans. One thing the author does very well is to move between national events to local events in Sussex, for example showing how the actions of Edward the Confessor on the national stage impacted Sussex locally, and what role Sussex played in those events as they unfolded. The Norman era gets its own section, as does the medieval period, where you learn about the devastation wrought by the Black Death, which killed off half the population of Sussex within a few months. Entire communities vanished, deserted as no longer viable, and landowners had to raise wages by up to 75% just to get enough labourers to tend their fields. In the turmoil that followed the Black Death, Sir Edward Dalyngrigge persuaded the king to grant him a license to crenellate his moated fortress of Bodiam Castle to awe the local peasantry and reaffirm the power of the nobility in Sussex and beyond. The Tudor and Stuart periods get their own section, as does the Hanoverian and early Victorian period. 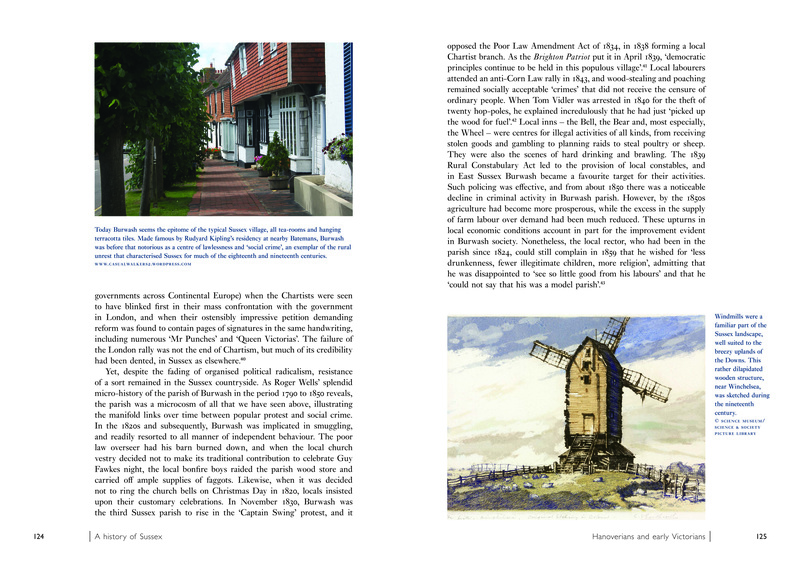 The bulk of the book is focused on the Victorian period and beyond, with the launch of the Railway Age, and a wonderfully detailed look at literary Sussex through the writings of Thackeray, Dickens, Virginia Woolf, Hillaire Belloc, Rudyard Kipling, and other great artists of the post-Victorian period. 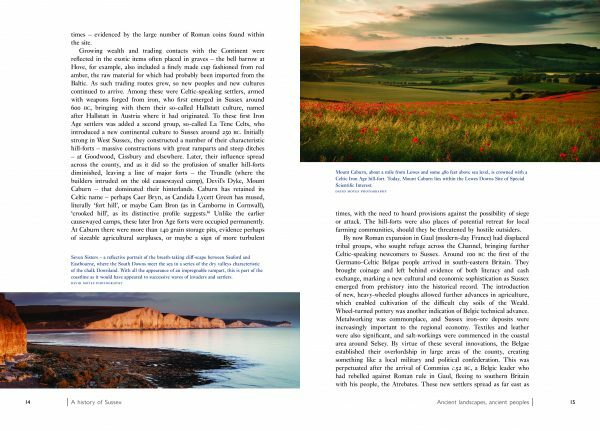 The final two sections of the book cover Sussex at war; first during the Great War of 1914-1918, then through the Second World War, when Sussex’s proximity to the English Channel put it very much on the front lines of the Home Front. It is natural, I suppose, that sections dealing with more recent events like the two World Wars are much more detailed and in-depth than other sections of the book, simply because there are many more sources and first-hand accounts available. The book absolutely shines in the stories of individuals caught up in the events of the war years. For example, there is the story of Major-General J Hamilton Roberts of the 2nd Canadian Infantry Division, who was stationed in Sussex in 1941. Roberts, who would go on to direct the ill-fated Dieppe raid, met and fell in love with a local widow, Mrs Anne C Fullerton. Robinson and Fuller were married at ‘a little church in Sussex in 1943, and the book includes a photo of the couple. It is this sort of personal touch; the stories of Sussex people caught up in the broad sweep of historical events, that the book does exceptionally well. Then there’s the tragic story of Doris Williams, who by sheer bad luck was out walking past Wilson’s Laundry in Kemptown on 23 February 1944 when a German bomb hit the building, sending a piece of shrapnel flying. The shrapnel hit her head, and though passers-by carried her home, she was dead before they arrived, leaving her fiance, a Canadian soldier stationed in Sussex, to mourn with the Williams family. The best compliment I can give an author is that I couldn’t put the book down. Philip Payton has pulled that trick off with aplomb. A History of Sussex is such a readable book, and the way the author weaves together stories of the individual people involved in the great events of history creates a wonderful example of just how good a history book can be. Highly recommended if you have an interest in Sussex, and just as highly recommended even if you don’t. A History of Sussex is profusely illustrated and comes with a very useful index and reference notes. It retails for ?19.99 and is worth every penny. 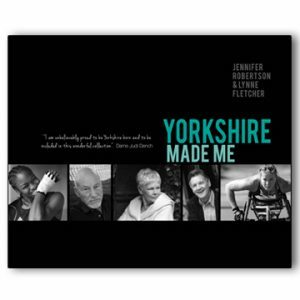 You can pick up a copy on Amazon or direct from Carnegie Publishing. Sussex history comes all the way from Oz! Sussex is celebrated as England’s front-line county in a new history by Professor Philip Payton. As he points out, it is obvious from the briefest glance at a map of Britain that Sussex, located at its southern fringes, must always have borne the brunt of attack and invasion from without. Philip argues in A History of Sussex that this accident of geography has been one of the key factors in shaping the county’s history, although by no means the only one. Armies, smugglers, traders, migrants and settlers have all landed on Sussex shores. Some of these ‘invasions’ have been benign, adding to the life and culture of the county, while others have been violent and devastating. “And yet it has always been, and still is today, a terribly-English place: pastoral and in many ways genteel; rich in history, with much of it still evident today; quintessentially the England that draws so many to these isles from overseas. Philip added: “I spent some of my formative years in Sussex when not in Australia and Cornwall, and attended Haywards Heath Grammar School. I’ve always been keen on Sussex castles, especially wonderful Bodiam, and as a railway enthusiast have been a member of the Bluebell Railway for many years. “I am an historian by background although I also used to be in the Royal Navy. I used to belong to the University of Exeter where I remain Emeritus Professor of Cornish & Australian Studies and am now at Flinders University in Adelaide, Australia, where I live. background of the county’s history.